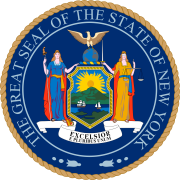 The 1920 New York gubernatorial election took place on November 2, 1920, to elect the Governor and Lieutenant Governor of New York, concurrently with elections to the United States Senate in other states and elections to the United States House of Representatives and various state and local elections. Despite losing reelection Al Smith would win the nomination as the Democratic candidate in the 1928 Presidential Election. ^ "New York gubernatorial Republican Democratic, 1920". ^ "New York gubernatorial Republican primary, 1920". ^ "New York gubernatorial election, 1920". This page was last edited on 9 March 2019, at 22:25 (UTC).